This is a bundle of 8 Lesson plans. One for each 5th grade common core literature standard (There are ten standards but two do not lend themselves to specific lesson plans). 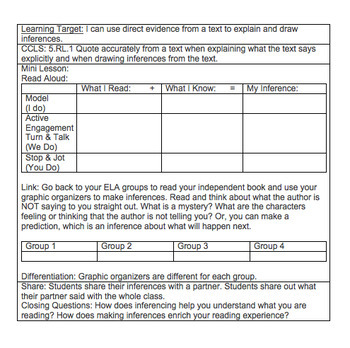 Each lesson includes a Learning Target, the standard, a chart to use during the mini lesson, an example of how to differentiate the lesson, and a place to write in your groupings. You can edit the lessons to fit your individual classroom needs. These lessons are generic can be used over and over again with any fiction book. Enjoy!